An investigation into alleged irregularities in the way a master’s degree was awarded to Madrid regional premier Cristina Cifuentes has now engulfed another member of her Popular Party (PP). King Juan Carlos University (URJC) is now investigating a similar degree awarded to Pablo Casado, a congressman and deputy secretary of communication for the PP. In 2009, Casado obtained the same academic qualification as Cifuentes, a master’s degree in public regional law from the URJC Public Law Institute (IDP). The growing scandal is casting a shadow over a public university with strong ties to the conservative group, and is eroding the PP’s hold on power in the Madrid region one year ahead of local and regional elections. Speaking on Tuesday morning on radio station Onda Cero, Casado detailed the requirements he was given at URJC in order to complete the course. “I was not required to attend class nor to take exams, that was what I was told at the beginning of the program, and that was my case,” he explained. Casado later used a press conference to further elaborate on the situation, in response to the original story published on Monday by EL PAÍS. He again stated that he didn’t attend class, take exams or produce a final thesis to later defend it before a panel. He did so, he explained, because he was following the instructions of the head of the master’s program, Enrique Álvarez Conde. The latter is the director of the IDP, where Cifuentes obtained her own degree in 2012. By that time, however, the program had been adapted to the European Union’s Bologna Process, which brought academic qualifications in line across Europe. Casado also explained that the university automatically waived 18 of the 22 courses from the degree – that’s to say, more than 80% of the coursework – given that he already had a degree in law from Madrid’s Complutense University. As such, he only had to produce four projects to pass the master’s program, totaling 92 pages of text. He added that he had also followed post-graduate programs at Harvard, Georgetown, Instituto de Empresa and IESE. “I did what I was asked to do,” Casado continued. “It didn’t seem strange to me. If there was something that wasn’t right, I was not aware of it.” Casado added that he was unaware if other students had received the same treatment. 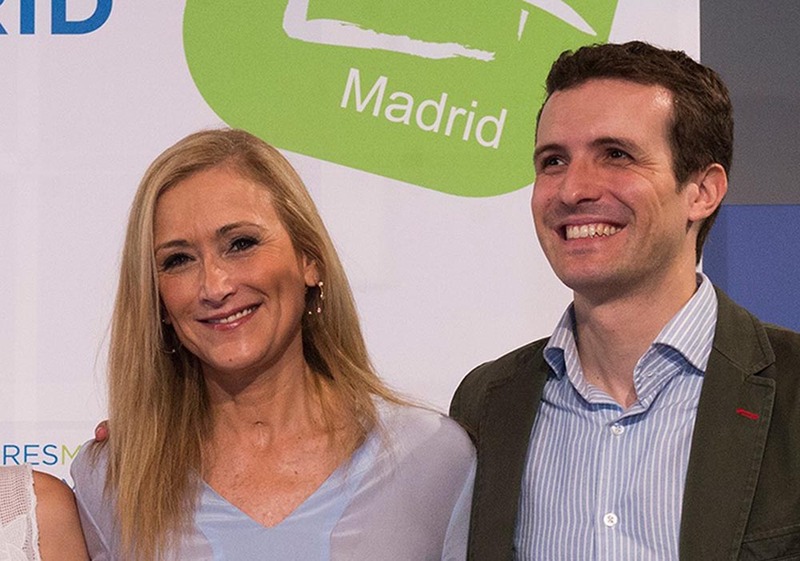 Casado is considered a likely replacement for Cifuentes with a view to the 2019 elections. So far, Cifuentes has openly rejected the idea of resigning over the scandal. Cifuentes’ political career has been seriously compromised by revelations that she never completed the coursework for the degree, and that she may not have defended her final thesis at all. When an online newspaper broke the story on March 21, Cifuentes produced a university document certifying that a three-member panel heard her dissertation on July 2, 2012. But two of those individuals have since denied being there, or signing any documents. They and the Institute director have denounced pressure from top university officials to produce paperwork that would back up Cifuentes’ claim about completing her degree. Prosecutors have taken up the case, as forgery of public documents is a crime in Spain entailing prison terms of three to six years. University sources have told EL PAÍS that an internal investigation headed by Professor Pilar Trinidad has now been widened to three other graduating classes at the URJC Public Law Institute, encompassing the time when Pablo Casado was a student there. Other well-known alumni whose degrees are being scrutinized include former banker Mario Conde and political figures whose names have not yet been revealed. On Monday, Casado told the Cadena SER radio station that as a student he reported to Institute director Enrique Álvarez Conde. “When it was time to hand in our research work, we did it through him,” said Casado. “I did what was asked of me.” This newspaper has been unable to reach Álvarez Conde for comment, but on Friday he told the Onda Cero radio station that the document sent to Cifuentes was a “reconstruction,” not an original document. The original record of Cifuentes’ thesis defense is nowhere in the university’s files, university president Javier Ramos has confirmed, also denying that he pressured Álvarez Conde into producing paperwork for Cifuentes. Professors who taught the program at the time said that attending class was mandatory Monday through Friday, as was taking the exams and defending a final thesis before an examining committee. One professor who taught the program told EL PAÍS that Casado was not on his student list for that year. Casado insisted that his degree is different to Cifuentes’, because in 2008 the university was not yet adhering to the Bologna Process, which harmonized higher-education studies across the European Union. As such, he said, his qualification was not properly a master’s degree, but an intermediary step towards a doctorate, which he never completed for lack of time. In 2008-2009, Pablo Casado was a regional deputy in the Madrid assembly and sat on two committees. He was also president of the PP’s youth group Nuevas Generaciones. The ongoing master’s degree scandal has spilled over into the campus at a public center that is no stranger to controversy: a former president, Fernando Suárez, was forced to resign from King Juan Carlos University (URJC) after it emerged that he had repeatedly plagiarized other scholars in his own work. On Monday, several hundred students congregated at the Vicálvaro campus to protest the Cifuentes case. “We want the mafia out of this university!” they chanted, reflecting anger at the alleged corrupt practices going on at URJC. Students also cried out: “Cifuentes is lying, Ciudadanos is looking the other way,” a reference to the party that is supporting the PP’s minority government. But Ciudadanos has just withdrawn its support for the embattled leader, and is asking for her resignation and replacement with an interim premier until the 2019 elections. What the protest party will not do is support a no-confidence motion tabled by the Socialists (PSOE) and backed by Podemos. “Now I’m afraid I won’t get hired after studying here,” said student Alba Argaz, voicing concerns about this new blow to URJC’s reputation. “We are seeing that there are first-class and second-class students at university, and in a society like ours we feel this is unacceptable,” added Aníbal Valverde, a student of history and political science. Sva prava zadržana AcademLink 2017.